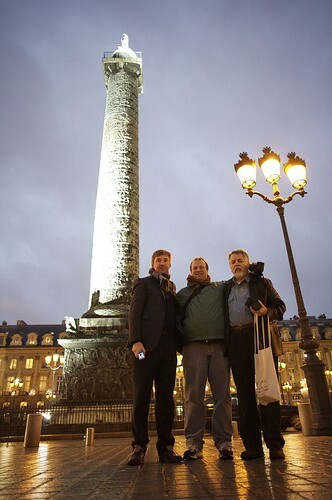 I was sworn to secrecy about what we were doing in Paris last December. You thought I was there to attend and speak at the LeWeb conference. I was. But we also were testing out Dave Sifry’s new business idea, which he now calls Offbeat Guides. Several people have blogged about them overnight. TechCrunch has a further writeup about the guides. So, what is it? It’s a paper book. Horrors! Paper? Travel guides? How old school. Heheh. But, from the moment I saw it I wanted it. Why? It was a paper guide customized to Dave’s agenda. His hotel was right on the cover. Inside everything he needed to know was there. His schedule. The restaurants within walking distance of his hotel (and other ones he wanted to visit). Weather. Transit stations. A list of cool tourist destinations we wanted to get to, and info that he needed to know about them. (When we tested his guide out we were standing in front of the Louvre in Paris). Even things like key phrases in the language of the region (good for finding a bathroom, or buying a beer), plus exchange rates, tipping guides, that kind of thing. But why are these so great? Because they are up to date to when you actually travel. Think about if you are in San Francisco this afternoon as a tourist. Your regular tourist guide has no idea what’s on Upcoming.org, but imagine you are right now looking for something fun to do and you’ve already been to Alcatraz and the Golden Gate Bridge. Why not come to the Cupcake Camp this afternoon? If you had Offbeat Guides, you’d have your favorite events listed inside. I travel a lot and this kind of guide is very helpful. Why paper? It’s a good backup. I have all my travel information stuck inside my computer, but what if my computer dies, or is stolen, or has a dead battery? Plus, I don’t always want to carry my geek devices everywhere, particularly when I’m on vacation and trying to get away from it all. Brilliant idea. Can’t wait to use it on my next major trip to an unfamiliar place (which will be to Washington DC on June 22). Thanks Dave for giving me an early look last December. In the photo that I shot in Paris’ shopping district that’s Dave Sifry with Doc Searls (co-author of the Cluetrain Manifesto) and Christian Lindholm (one of the key guys behind the Nokia Series 60 phone). Our little tour was a lot more fun thanks to Dave’s new idea. Great post about a great idea. Not too sure of just the paper copy, would love to see a google document, so I can pull it from any kosk perhaps. made my first guide last night – it is GREAT! One of the problems with travel services is remembering to print out the guide or the agenda or whatever they call it. I’ve been using tripit.com for a long time. I really enjoy the service for planing, scheduling, and finding my contacts that are close (let me know if you want to get added to my list and we can meet) but one of the problems is forgetting to print out the schedule and bring it with me. Cool. Wish I could get a super secret invitation code. I’d really prefer these would sync with my Amazon kindle via USB. I can convert the PDF but its not as good as a native kindle version. Jeff Bezos has said kindle sales are around 6% of books total, this could be a very good fit for these guides. Robert, thanks for the kind words. So glad that we can finally talk about all the stuff we’ve been doing for the last 6 months! Vinnie, thanks for the tip! I just ordered the book at Amazon. Adrian, I just bought my first Kindle and I have the same idea as you. Stay tuned! Eh? Lonely Planet and has Fodors been there and back and then again, forever looped, what’s so special here, just “fresh” web data about crazy offbeatish events? LP and Fodors already hit the main ones, the ones that 99% of travelers will care about. Plus, a few web searches, local newspapers, would grant far more than these guides could ever cook up. I found tons of info about an upcoming Florida romp, in one Google search, if people are too lazy to search the web, so be it, pay that script-it-up guy $25. Sifry looking to blow out another start-up, eh? Reselling “wisdom of the crowds” free information, tons of companies that do that scam with free government info, Sifry just playing the same scam only kicking up the “convenience” and “exclusive” adjectives. But it won’t work, here’s why: 1. Travel is down (seriously down), 2. the guides are not personalized enough, and, for number 3, easy enough for a big name to add such info, if much demand (which I doubt), as a professionally written guide will always win over a raw random assemblage grab-bag of misc. information. Plus, the type of people that really want to goto Cupcake Festivals, whilst traveling is minimal, most will just hit the main sites, find good hotels and great eats, and relax, that covers 95-99% of leisure (and business) travelers, and the type of person to which this pitch would appeal, will undoubtedly, need more far specialized information. Plus a $25 professionally written guide will be timeless, this stuff is throw-away the second after the trip. Dead in water, plus he’s getting you to help promo, the biggest short-sell signal ever, the Curse lives on. And finally, this is another one of those circular selfish things, people of like-minds, creating ideas that appeal to their core group, throwing demographics out the window. Techcrunch has a Paris guide as an example. It is possible to print the guide to a printer or PDF right from the Techcrunch site. Many thanks for the free Paris guide TC! I love this idea. This sounds particularly useful for shorter trips and city breaks. Lonely Planet et al are fantastic for long and generalised journeys but even so are far too big and heavy if you want to travel light. I wonder if they have backpackers in mind too? Just bought the Tulsa Guide… This is really cool stuff! The folio format is great. The information is really solid for an early beta stage. Technically speaking its really, really tight. Like it. A LOT! I knew when Dave took us into confidence on our photowalk in London he was onto something. I’ll sure help to promote it. Great job Dave and co! Hey Robert! Whatcha got planned when you’re out in the DC area? I’m based out there. We have a bunch of great start-ups in the DC area. I work at one of them (Clearspring – http://clearspring.com). If you’d like to meet some, i’d be happy to make intros. I found your blog via Google while searching for travel guide to amsterdam and your post regarding Blog Archive Walking around Paris with Dave Sifry « looks very interesting to me. I have a few websites of my own and I must say that your site is really top notch. Keep up the great work on a really high class resource. You maybe correct that every tourist guide will not have total knowledge of every aspect of a city – but in general a tourist guide is a hard working professional that adds alot of valve and local wisdom for a new overseas visitor to their country. Do you think that is a fair comment amigo? Totally fair, Dave! In fact, we’ve been exploring some ways that hard working guides can leverage their expertise in the places they know, and make extra money and promote themselves to boot! More to come, and thanks for the great feedback!